Elvis' 24 greatest recordings here are painstakingly compiled and remastered from the original 1, 2 and 3-track master tapes lovingly stored in the vaults of RCA-Victor. All the hits are here from 1956's "Heartbreak Hotel" to 1969's "Suspicious Minds." This three-LP Fort Knox of music is mandatory for every music lover, let alone Presley diehards and record collectors. A long-out-of-print audiophile favorite — known for its first-rate sound quality — it gets the royal treatment here on six wide-grooved sides of 45 RPM 200-gram super-silent vinyl. Incredible! Until now, Elvis fans have satiated their desires with the prized DCC double LP edition (reaching prices upwards of $350 ) as well as the DCC gold disc (a rare find fetching $150 and more). Now no longer do you have to pay a premium to enjoy the magic of Presley's voice, rhythms and foundation-paving melodies. Mastered by George Marino, the King's best work has never sounded so intimate, detailed, present and alive. Images are true, tones are balanced, and the unbeatable warmth that only analog provides comes through unabated on every cut. Contained in the grooves of this album are some of the best rock 'n' roll cuts recorded in the last 50 years. Had Elvis Presley done nothing else but record "That's Alright, Mama," his place in pop music history would be secure. Presley fused rhythm and blues with country and legitimized beat music for white audiences. 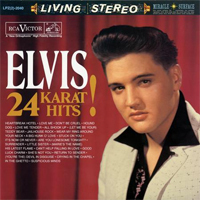 On 24 Karat Hits, every memorable facet of Presley's multiple personas is represented:The hip-shaking rebel ("Jailhouse Rock"), sensitive balladeer ("Can't Help Falling in Love"), beckoning romantic ("Are You Lonesome Tonight"), teen idol ("(Let Me Be) Your Teddy Bear"), socially conscious soul man ("In the Ghetto"), and passionate loverman ("Suspicious Minds"). The two dozen songs on this golden compilation read like a history of pop music and play like it is unfolding before our very eyes. There's no substitution for the experience this set provides. Do not miss the chance to own part of American history in unsurpassed fidelity that brings the cream of Elvis' music into your room, in stunning clarity. This release is a gem. Buy two copies: One to treat your ears, the sealed copy to treasure as an investment. Solid audiophile gold — indeed! It's no understatement to call Evis Presley the chief catalyst of the rock 'n' roll era. Presley earned his nickname "The King" by releasing dozens of course-altering singles over the course of his influential career; during the 1950s Presley's records spent a collective 53 weeks in the No. 1 chart position. Almost everything you could want from Elvis is in one towering collection — 24 Karat Hits, now a brilliant 45 RPM, three-LP set released by Analogue Productions! Elvis' 24 greatest recordings here are painstakingly compiled and remastered from the original 1, 2 and 3-track master tapes lovingly stored in the vaults of RCA-Victor. All the hits are here from 1956's "Heartbreak Hotel" to 1969's "Suspicious Minds." This three-LP Fort Knox of music is mandatory for every music lover, let alone Presley diehards and record collectors. it gets the royal treatment here on six wide-grooved sides of 45 RPM 200-gram super-silent vinyl.